In 148 days until Dave and I will say “I do” in front of 150 of our closest friends and family. Right on. 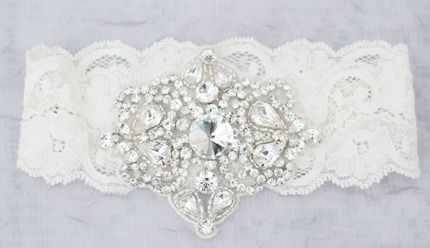 And when I say “I do” to my sweetie, I would like to be wearing a vintage-inspired, crytsal-encrusted, lace garter in ivory under layers and layers of organza. It will be the adult’s version of the tinfoil-wrapped loonie hidden in the centre of a child’s birthday cake. My current first choice is the lovely “Stella” from the Emily Riggs Bridal collection. This entry was posted in Uncategorized by lovewritenow. Bookmark the permalink.